From today, millions of visitors from around the world will be farewelled by a striking work of contemporary art by Kamilaroi artist Archie Moore as they depart Australia. 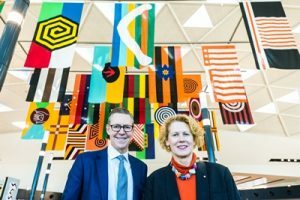 Moore’s United Neytions, which consists of 28 large flags that hang dramatically from the 17-metre high ceiling of Sydney Airport’s T1 International Marketplace, was this morning unveiled by the airport and the Museum of Contemporary Art Australia (MCA) for the first time. United Neytions will contribute to a strengthened cultural experience for departing visitors and leave an enduring positive impression. Moore’s work also speaks to the incredible diversity of Aboriginal histories and cultures in both Sydney and Australia. As part of a landmark partnership between Sydney Airport and the MCA, Moore’s work was selected from among a number of artists’ proposals by an esteemed panel. Sydney Airport CEO Geoff Culbert said travellers were certain to walk away with not just a memorable artistic experience, but a deeper appreciation for the diversity and vibrancy of Aboriginal cultures and histories. “We’re proud to support Archie Moore’s vision and are excited about the incredible cultural experience United Neytions will foster,” he said. “We’re committed to celebrating the very best of local and Australian talent and showcasing our city and nation’s rich and wonderful stories. “We’re very much focused on continually finding new ways to ensure both local and international travellers enjoy a dynamic and unique experience whenever they visit Sydney Airport. “From today, the millions of international travellers that pass through Sydney Airport each year will depart with a striking visual representation of our nation’s cultural fabric and a taste of Australian art, thanks to this incredible work by Kamilaroi artist Archie Moore. Moore, who is recognised as a leading contemporary Australian artist, said: “I’d like to thank Sydney Airport who, partnered with the Museum of Contemporary Art Australia, have provided this opportunity to reconfigure United Neytions. “This opportunity has allowed this series of flags that celebrates issues of place and identity to adopt a scale and status that official international flags have; drawing attention to the histories, voices and presence of local indigenous people on whose traditional lands the airport lies, but also the passages of cultures, pasts, territories, ages and cultural knowledges that airports foster. Moore’s work is a major addition to the significant art collection already on display across Sydney Airport’s terminals, which includes pieces by a strong mix of local, international and Aboriginal and Torres Strait Islander artists. Sydney Airport is also in the process of finalising its first Reconciliation Action Plan.